If you’re looking for a genuine adventure- exploring long forgotten caves, abseiling waterfalls, rock climbing, and invigorating pools then a Canyoning adventure is the one for you! Canyoning is an incredible adventure sport predominantly in the Blue Mountains 1.hrs west of Sydney including beginners canyons of The Grand Canyon, Empress Falls and Serendipity Canyon. Descend off the sandstone plateau into a land of amazing waterfalls, rainforests and crystal clear pools, mirroring brilliant Australian skies, formed over millions of years. Canyoning can involve abseiling (rappelling), water jumps, bushwalking, short swims, wading, rock hopping and climbing. Its challenging, physical and great outdoors fun. Quench your Thirst for Adventure Experiences – Go Canyoning! In excess of 300 canyons exist in the Blue Mountains one hour escape from Sydney along the Eastern Coast of Australia. Bushsports operators are Licensed by the National Parks and Wildlife Service to conduct guided canyoning adventure tours within 9 stunning canyons near Katoomba. 90 minutes drive or train West of Sydney. When to go Canyoning: Daily November, December, January, February, March season finishes mid April just after Easter. Transport to Canyons: Western Line Trains to Katoomba Station, Blue Mountains. We supply mini bus transport to the canyon adventures from Katoomba Station. Looking after you: The latest canyoning adventure gear. Full professional padded canyon wetsuits cleaned daily, dry bags for your gear, within canyoning back packs, canyon helmets, nutritious filling lunches & snacks. 1st step – get Ready! Jump in Abseiling + Wet ‘n Wild Empress Canyon. Finishing with a spectacular 30m waterfall abseil! If Empress Canyon is unavailable Dargans Creek Canyon is the adrenaline shot! 40m abseil entry adrenaline pumping adventure. In the cooler months select Birrabang or Tigersnake Canyons. Empress Canyon: Beginners abseil + canyon fun package. Available every day! The most popular Wet ‘n Wild Blue Mountains canyon. Double Dip Download Canyon: Twister n Rocky FUN Mountains canyoning. Wollangambe Canyon: Airbed Rafting Canyon Challenge. Tigersnake Canyon: Available year round ideal, over winter. Claustral Canyon: Serious challenge canyoning. Guides – Trained Professionals Qualified in: Canyon instruction, First aid, Emergency response, Navigation, Life-Saving and Roping Techniques. Skilled in: Guiding, interpretation. Safety – Operating by best practice, exceptional equipment and safety record. The highest standard in risk management is applied. Our guide to client ratio and maximum party size policy ensures you are well looked after. Provided – Everything you require. Helmets, harnesses, Abseiling equipment, safety systems, first aid kit, delicious lunch, waterproof dry bags, padded canyon wetsuits and canyon packs. All Gear Provided – Is of Exceptional Quality! National Parks – Your entry fee is paid, which in turn supports NPWS. All operators utilised by BUSHSPORTS carry current accreditation and an Eco Pass access for National Parks. Education/Interpretation – Guides are passionate canyoneers who inform you of the environment geology, habitats, animals and history. Further developing your canyoning skills. 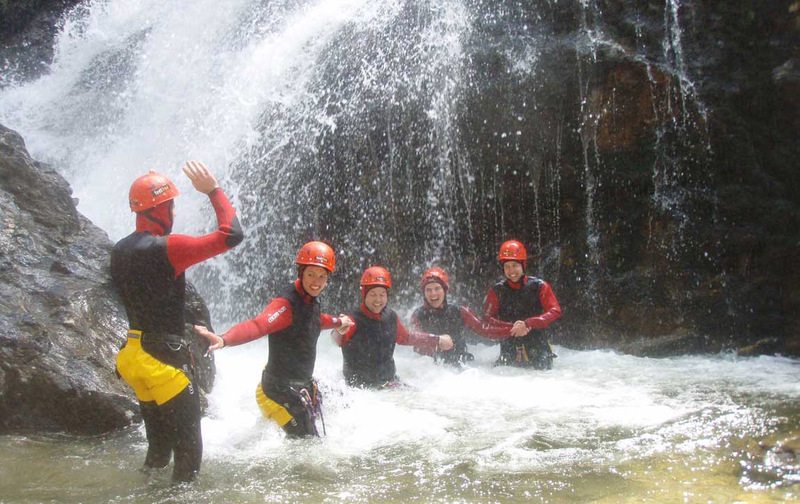 Taking or joining groups to experience Canyoning, Abseiling or Caving? Get set up with the right canyon and adventure hire gear from professionals. Canyon Wetsuit Hire, excellent quality Neptune Wetsuits especially designed for canyoning. All sizes from small slim builds to super sizes. Japanese Neoprene Double Stitched, knee protectors, front zippered. Group adventure equipment hire discount rates. 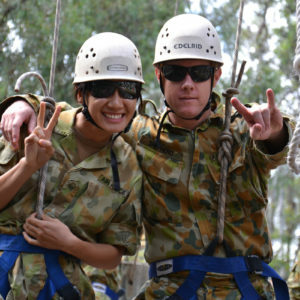 Multi day rates and extra free equipment hire on large orders for adventure training, scouts, duke of Edinburgh DOE award and Australian Defence adventure training. Pick up adventure hire equipment for weekends on Friday – return Sunday or Monday at no extra charge. Empress Canyon + Abseil Wet ‘n Wild adventure! A morning introductory and refresher canyon abseil course, familiarises you with the abseil techniques for Empress canyon. After a delicious lunch enter a Wet & Wonderful Canyon. Empress Canyon is tucked away in Valley of The Waters, a flowing watercourse, with majestic swirl pools, eddies and currents gouging deep into the cliffs. Descend a nature trail surrounded by Blue Mountains heath and hanging swamps teeming with bird life. Wet suits on, enthusiasm in full gear, venture along rock pools to take the first electrifying plunge. Through narrow slots, between towering sandstone ramparts the adventure unfolds. Plunge into the flowing current, swim, wade and rock hop along the canyon-floor amidst overhanging ferns a beautiful rainforest environment. The canyon soon steepens sharply, water spraying 30m over Empress falls into a deep plunge-pool. Harnessed and checked each person abseils through the spray of the waterfall, feeling exhilaration and a great sense of achievement! A short steep walk up step ladders exits the canyon. Grade: Beginners – Intermediate (refresher abseil techniques covered on the day). Basic level of fitness required. Group rates for >10 people call us to negotiate an excellent group discount rate. If a very large group or empress is unavailable: we will upgrade you to Dargans Creek Canyon with a 40m abseil at no extra charge. Weather: Our trips are rarely cancelled. However if so, you will be contacted. Guides: Are qualified, experienced outdoors people committed to ensuring you get the most out of the adventure. They will share with you their enthusiasm and knowledge helping you gain confidence and skill as you progress. Your next adventure event…BUSHSPORTS ! Fortress canyon is an excellent canyon with a great diversity of thrilling water jumps, wades, swims and a short abseil into the cool flowing water. 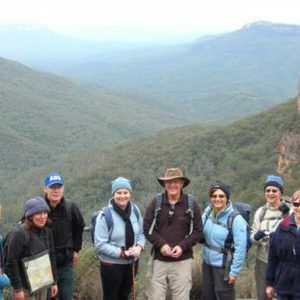 The adventure unfolds as you bushwalk along Fortress Ridge with sweeping Grose Valley views over basalt capped peaks and gaping chasms into Blue Gum forest. Enter the narrow canyon confines, intertwined with rocky pagodas, hanging swamps, overhangs and emerald fern-trees. Plunge into deep shimmering pools, duck-under strewn boulders exploring an eroded sandstone environment which is magical, exciting and compelling. Eastern Water Dragons and miniature Yabbies are observed as we wade along the canyon-bed. One easy abseil takes us closer to a secluded platform perched within the Fortress’s sheer sandstone walls with extensive views into the Grose Valley. Serendipity Canyon – A lucky canyon discovery! “Serendipity” means the faculty of making lucky discoveries. A stunning canyon, descending from the basalt rich soils of Mt Wilson and spilling out into the the Wollangambe river. Explore a majestic rainforest environment abundant with overhanging tree-ferns, yabbies and native fish darting in clear fresh water. Several short abseils unfold the adventure, plunging into deep pools, swimming through narrow swirling currents past sandstone parapets. Marvel and appreciate the beauty within this remarkable moss-lined canyon whose integrity has not been diminished by careless trampling. Exit is a white sandy beach surrounded by towering weathered sandstone cliffs and the swift aqua-blue currents of the Wollangambe River. Cost: enquire for exclusive group adventure rates available. We run our summer canyoning programs between the months of Septemeber and April. We urge that you dress prepared for the weather, bring shoes you are comfortable getting wet, swimwear, extra water and a camera( waterproof camera, as you will get wet). An exciting morning of Abseiling, steadily pushing your skills, as you descend cliff starting at 5 meters steadily building up to 30 meters. After lunch you’ll walk through a beautiful rainforest gully, all the while learning about the geology, flora, and fauna of the area. Your path into the canyon is a 20 meter abseil down into the canyon floor. Follow the canyon’s unique rock formations, narrow passages, and walls lined with ferns for two hours of walking, wading and swimming. end this epic canyon activity with a 30 meter swim to the canyon’s end. The walk out is just as amazing as your descent, as you absorb the gorgeous views over the Grose Valley, on the Evans lookout. A 30 minute stroll into this canyon, allows you to take in the Grose valley and the many hanging swamps. After this short walk you’ll descend to the start of the canyon, where you’ll encounter a small creek which leads into your first water jump. Deep into the canyon you’ll encounter deep water jumps, swim through narrow rock gorges, and journey beneath the earth to a hidden rock pool. Enjoy lunch at the canyon’s end, as you enjoy the creek spill over the 100 meter cliff bordering the Grose Valley surrounded by the 550 meter walls of Mt. Banks, the highest in Blue Mountains and the Blue Gum forest. Your walk out quickly ascends onto Fortress hill and then Fortress Ridge, after an hour of which you’ll arrive back at the vehicles ready to take off. Rocky Creek is considered by many who know the Blue Mountains a “must do”. A short walk brings you to Twister Canyon. Fit your wetsuit and get ready for the fun! Jump into a pool, swim across and get ready for 7 more jumps! A total of 8 pools! After the drenching experience, follow a trail into a magnificent valley lined with tree ferns and arrive at Rocky Creek’s start. Take on rock slides,70 meter high walls, tunnel swims, and waterfall scrambles before you leave the canyon. After a short walk, you’re out and ready to head back home. A unique canyon, as you are capable of rafting along the river, conquering small rapids along the way. Witness the infamous Jurassic Wollemi Pines, as you walk to the canyon passing through the Wollemi National Park along the way. This canyon provides many chances for exhilarating water jumps! The ideal canyon for those looking for a relaxing adventure. The narrow side canyons hold such secrets as the Kelvinator, named after its chill waters. Prepare to be refreshed and invigorated after this relaxing adventure. The Mt. Wilson Canyon harbors the pleasant Serendipity Canyon. An easy half hour bush walk takes you to a 15 meter abseil leading down into the the lush rainforest. A series of abseils along the creek take you will the canyon walls gradually rise on either side of the creek. Finish your journey by traveling through a tunnel, ultimately arriving at the gorgeous Wollangambe river. Enjoy lunch, a splash in the main river, and then a casual hour walk back to the cars for home.